My card for today is for Bugaboo's Oldie, But Goodie Thursday. Thursday's are my favorite Bugaboo challenges, what a great idea to go through the images you have and find one to play with. As soon as I saw this image I thought it would make really cute baby and birthday cards. I was going to put a sentiment on my card, but then I decided not to- I can always add one later. I printed the image and colored it using my SU markers. Although the black part of the puppy looks black, I actually used my grey marker to color it. I do this a lot because sometimes I feel that the black marker can be a bit harsh. Once I was finished coloring my image I added some white dots on the balloon using my white gel pen (I love my white gel pen, can you tell...LOL?) And just along the outside of my oval image I did a added a line/dot border using my creamy caramel marker. I also have two rows of paper piercing along the very bottom of my card, but it's hard to see in my photo. 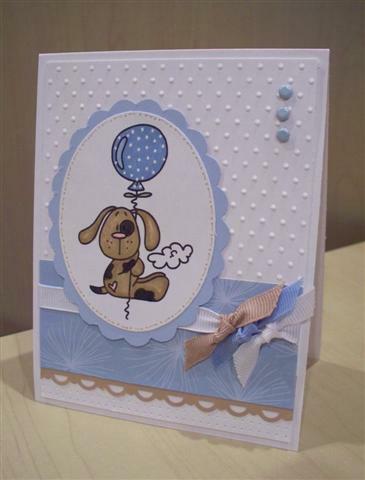 My background is embossed using my Cuttlebug and Swiss Dots embossing folder. I cut out my scalloped oval using this technique that I posted last week. I wanted to mention this because I did say that this technique works with ovals too and I wanted to show a scalloped oval that I made. I have a neat little trick that I used with the ribbon on my card. I knew I wanted to tie some smaller pieces of ribbon on my card, but I didn't have any caramel or blue ribbon, so I used white ribbon that I already had and then I colored it using my SU markers. After doing this several times, I have learned that you need to color both sides of the ribbon and then it helps if you dry it with your heat gun, otherwise you will have to let the ribbon dry for awhile. This works great and I do it all the time, bet you never would have guessed that I colored my ribbon to match my card?! I love this card.So Pretty.I love the way you put DP on the balloon.Thanks for the inspiration. Super cute Patty!! Love your color combos!!! Pretty baby card Patty! I didn't know you could color the ribbon like that. Thanks for the tip. I love your card, the simplicity is striking! Coloring your ribbon was a great idea! Beautiful- your card is so pretty- love the DSP on the balloons! I like the embossing on the card- it is perfect! Love the ribbons. This is darling Patty. I think it would be super cute for a baby boy's first bday.